What’s better than a cup of tea and a slice of your favourite cake? 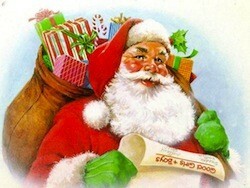 What about a cup of tea, a slice of cake and a visit by Santa with a gift thrown in for the kids? That’s exactly what you can do today in O’Hehirs famous bakery and cafés in Letterkenny and Donegal Town. The Big Man will drop into O’Hehirs between 11.30am and 5pm. For just €4.50 all children can have their picture taken with Santa and will even receive a free gift. And the very decent people in O’Hehirs are donating all the proceeds from today to St Vincent De Paul. So why not put aside an hour today and get into the Christmas spirit. O’Hehirs can’t guarantee a white Christmas. But they can guarantee fine food, great craic and all the while helping people less fortunate than ourselves.